The Red beach is one of the most scenic and interesting beaches on the island. Is located on the southern coast of Santorini, in the Akrotiri area. 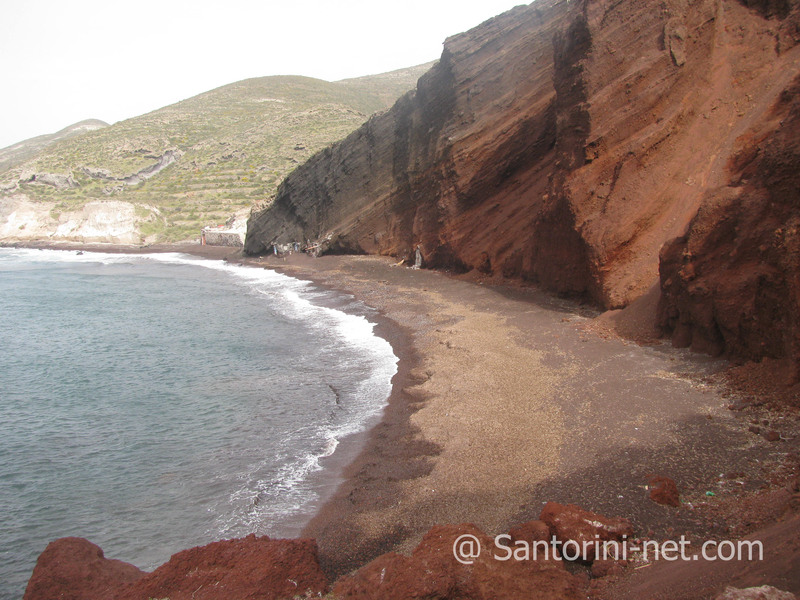 The beach earns its name from the red sedimentary rocks in the cliff face towering above you, as well as the reddish pebbles. The scenery is truly majestic and you will not find such a color scheme anywhere else. This beatiful beach is a sight on its own. 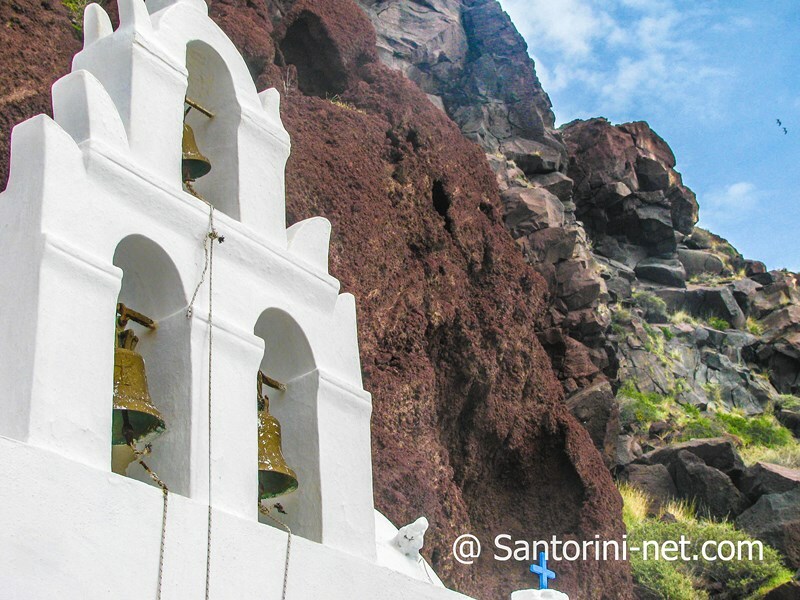 Is widely known for the soaring red cliffs which drop right to the sandy shore and into the crystal-clear blue waters of the Aegean Sea. A unique contrast. It can be reached either by water taxis as there are several connecting the beach with Akrotiri or Perissa either by foot (10 minutes’ walk from Akrotiri, you have to reach Agios Nikolaos church in Akrotiri next to the excavations area). It's worth climbing over the very rocky trails and stand atop the cliffs for a view down. 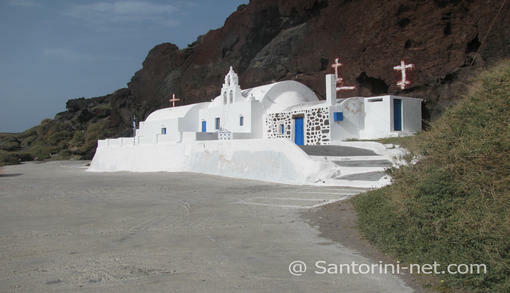 Here you will find two canteens to get the necessary refreshments before you take the path to the beach. It is not so very large so it can get crowded quickly. The beach is narrow and shelves rather steeply into the sea. Also is sheltered from the winds and can get quite hot. It is organized with white sunbeds and umbrellas. It’s an ideal beach for snorkeling due to the interesting rock formations and plentiful marine life. 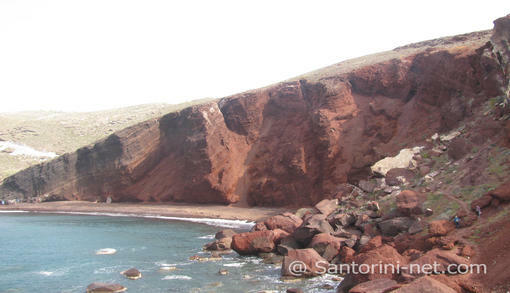 The Red beach is not far away from the ruins of the Minoan city (Akrotiri) and is definitely worthwhile to take a visit.